Our last update ended with the news about the small but important start we made regarding JJSS children’s club in Araria RS. Since then, the club has grown in leaps and bounds in both the number of activities and membership. Any given Sunday morning, there are over 50 children waiting excitedly for the 2-3 hours of fun and learning. The club prayer is now in the memory of a few of the kids though they did not rote learn but just repeated it with the club facilitators over the many Sundays we spent together. “Swayam vidhata ho hai manav, antar mein vishwas jagao. Chalo na mitte padchinhon par apne raste aap banaao.” Our kids can make make lines or circles, to play games, more easily, no adults are needed to organize them into lines and circles, may not sound like a big achievement, but it brought tears of joys to one of our facilitators, who has been there from the first club. The latter got a huge impetus by the start of club’s library with 100 Pratham books. These colorful story books of different reading levels in English and Hindi have been well taken by the children. The book-keeping of which books are in circulation and issued to whom are done by the senior children of the club. They also take responsibility of collecting the books at the beginning of the club and issuing new books at the end of it, in addition to ensuring that books are maintained properly. We hope to make regular additions and assess the learning impact in future. Probably the club’s biggest draw these days is Meena, an animated series created by UNICEF for the girl child, in the late nineties, sadly still relevant. Thanks to our new tech-gear, we have been able to screen two clips every Sunday. From pointing out the differences in diet and work distribution that are the societal norms, to how girls can do male-tasks, Meena and her parrot, Mitthu, have shared a lesson or two with everyone. But not everything has to be educational, so we have screened films like the Lion King and slowly building a content library that can be shown to the children. Even in the current age, girls are not given equal opportunity to pursue their education. Lack of funds and what they will do with their education are given as two main reasons for this continued discrimination. And the fight to end this discrimination is as important for JJSS as NREGA wages or pension coverage. Thus we have decided to extend financial support to our members who are sending their girls to high school and beyond. While this amount is not sufficient to cover all the costs like monthly tuition fees, books and supplies etc., we feel it shows our support to them. The scholarship was offered to all girls studying in 9th class or higher, if at least one of the parents was an active member, and a completed application was submitted. 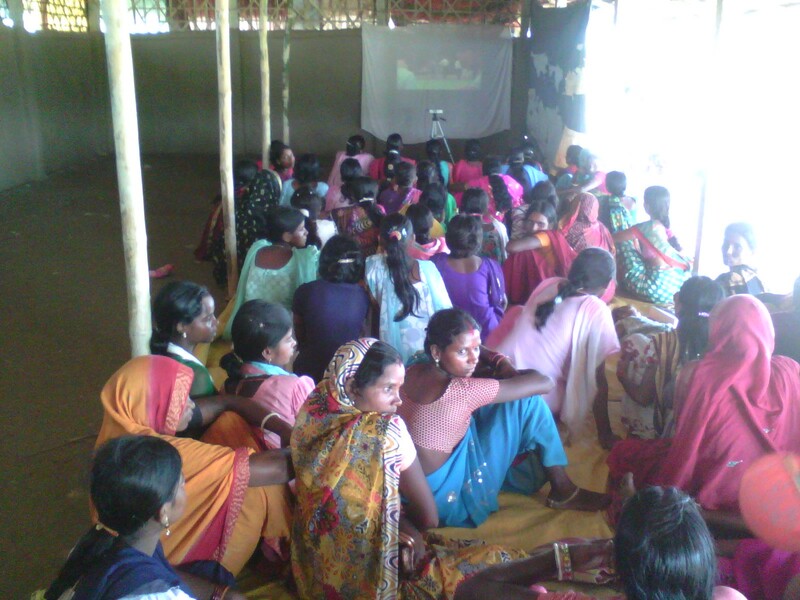 We selected 29 such applicants and called them and their mother for a day-long meeting in Araria. When the group arrived on June 16th, it was definitely a mixed group with some very active members and some that were basically card-holders. Even our scholarship recipients formed a full spectrum from the very motivated and curious to the shy and quiet. And when we found out that 10 of them were already married, with one already having a kid, it brought some uncomfortable truths to the fore. But how can we enable change if we are not willing to acknowledge the prevailing conditions? The first session was to give them a background of JJSS and the importance of this scholarship. This was followed by a screening of Chak De: a story of women’s hockey team, followed by the disbursal of the first installment. By the end of the day, we felt good, powered by a different experience, and were thinking aloud regarding the other possibilities, what else we can do with this group. 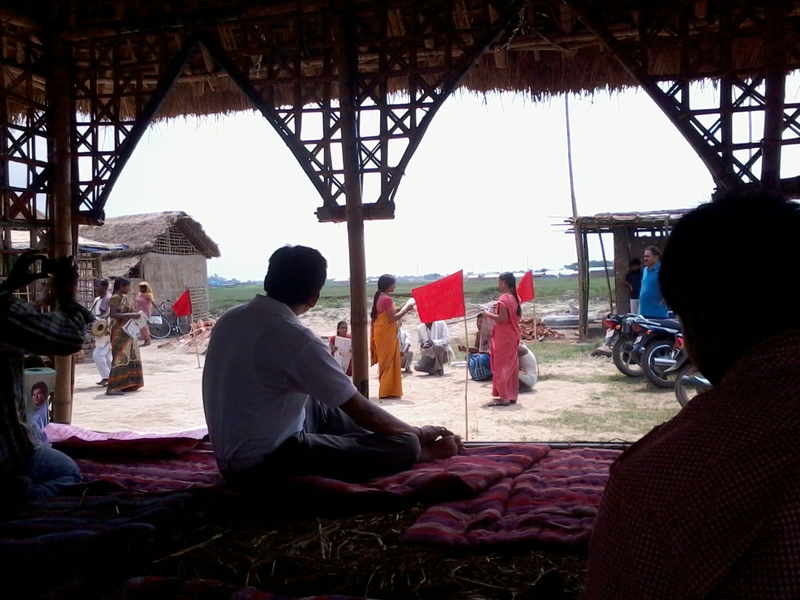 After the first natak kaaryashaala held in araria in September 2012, we met again in June 2013. But this time we were a larger group with saathis from Sangatin (UP), BMW (Muzaffarpur), and two seperate teams of the JJSS from Araria and Katihar. Raju ji, Shiv bhai, and Neeraj facilitated the making of 3 separate plays based on scripts developed by saathis from the different sangathans. 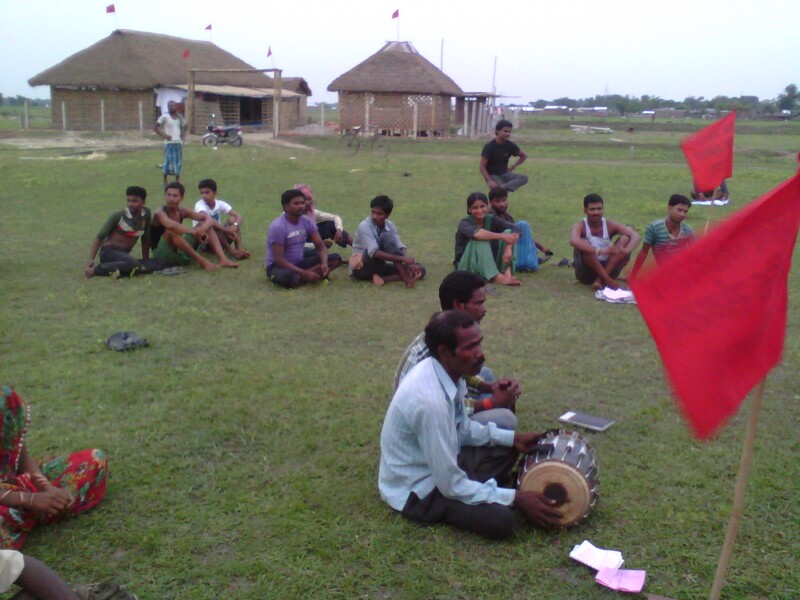 Since then, the Katihar team has performed the play they developed across their district through a yatra and also at the rozgar sammelan in Madhya Pradesh.